NYC Recession Diary: Liliana Rose: NYC Recession Diary Readers get Free CD! Liliana Rose: NYC Recession Diary Readers get Free CD! 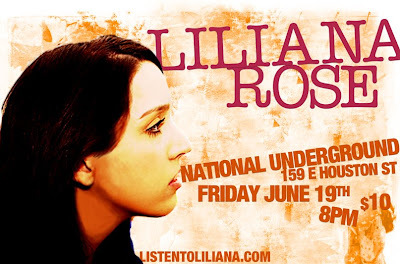 Liliana Rose is a hot, upcoming artist with a hot, upcoming show. This Friday, in fact. And guess what? The first 20 people who go to her show, bring this flier with them and mention NYC Recession Diary get her CD for FREE. The show costs $10, but for live music and a free CD, that's pennies! I heard a rumor there's drink specials, too. She's got a folksie twang you just can't resist. Come get lost on Friday with us.